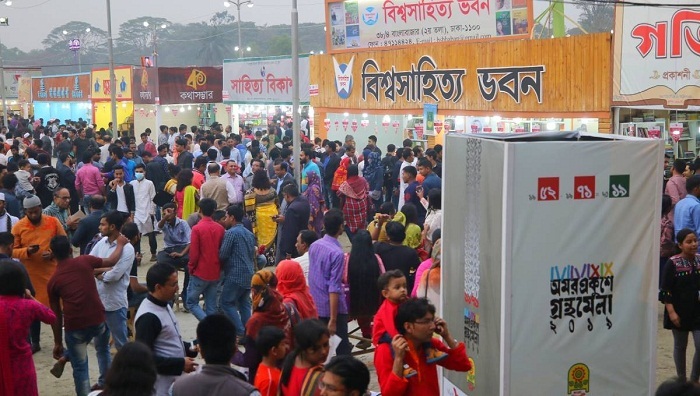 The Amar Ekushey Book Fair has been extended by two more days. The fair was originally scheduled to end on Thursday but it will continue till Saturday. “The fair will end on Saturday. It’ll remain open from 11am to 9pm on those days,” Bangla Academy said in a statement. Altogether, 4,685 books have been published during the fair. This time, publishers sold books worth around Tk 78 crore – nearly Tk 7.5 crore higher than the previous year. Bangla Academy also had a brisk Tk 2.15 crore sale. The announcement of the fair’s extension came shortly after a concluding ceremony was held. “The book fair’s time has been extended by two more days at the order of the prime minister,” said Faisal Hasan, senior information at the Cultural Affairs Ministry. He said the publishers and writers had been demanding increasing the fair’s time. Daily discussion events were held at the book fair on various themes and personalities on the main stage of the Academy premises. Poet Jasimuddin Literature Award 2019 was awarded to poet Nirmalendu Goon. At the closing ceremony, Bangla Academy also handed over awards to winners of its ‘Gunijon Sahitya Puroskar’ chosen from among the publishing houses that participated in the fair. The ‘Rokonuzzaman Khan Dadabhai Smriti Puraskar’ was awarded to the Panjaree Publication for publishing excellent books for kids while ‘Qayyum Chowdhury Smriti Puraskar’ was given to three publications – Maddoma (Single Unit), Batighar (Multi-Unit) and Panjaree Publication (Pavilion) for best interior design which is aesthetically rich.